Height: 3.562". Width: 3.75". Thick: .020. Weight: 0.4oz. Stamped steel. Candle holder: Two tone bronze. Leaf: Dark green with lighter highlights. Berries: Red with some glitter. 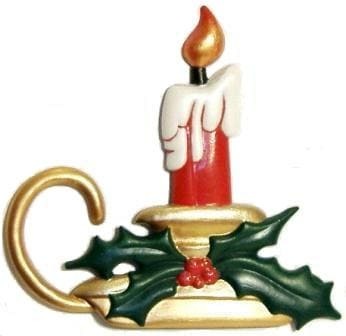 Candle: Red with white melting wax. stuffers. Personalized for a great gift. Fine Christmas tree ornament.